Very similar to the flooded battery except the acid has had a gel added to it to make it more or less solid and the pressure release lids are no longer needed. A wide variety of capacities. Update there is a thory that a SLA battery can be reconditioned by charging and then discharging (fast) about 10 times. I have tried this technique with a few 6 Volt batteries with variable success, some batteries recharge and then begin to hold charge others are simply to damaged internally. This became relevant for me as i recently found a large capacity 12 volt SLA and I’m attempting to recondition it using a battery charger and a 50W halogen bulb for discharging and I’m currently at the second discharge cycle. So with a 50W bulb how much current will I be using? Wires rated for 10A so no problem. A more portable version of the car battery weighing in at 1.5 Kg for a 7.2 amp hour battery. Posted in 12Volt, Battery, Electrical, Energy, More to come. You probably didn’t realize just how specific you must be to define what type of battery you are talking about. 12Volt : This is the voltage, some batteries similar in appearance are 24V (common in trucks for example). 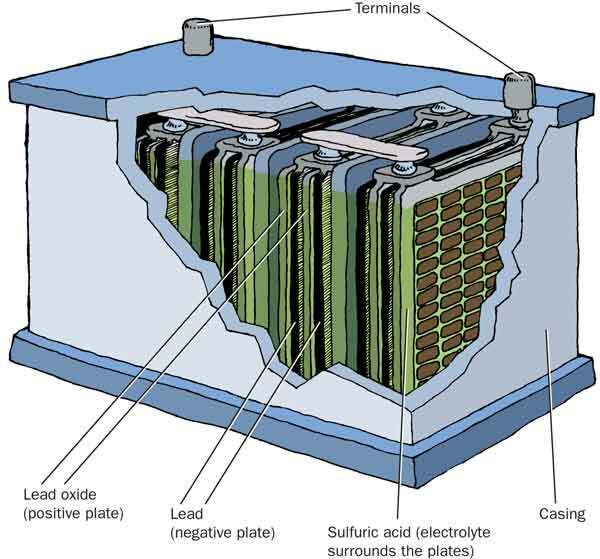 Lead acid: (sulfuric) is the internal chemistry of the battery, sometimes this term is chemistry or battery chemistry. Flooded: means the acid is liquid rather than as a gel or an electrolyte in a solid or granular substance. CCA: Cold Crank Amps, the level of current the battery can produce at 32F (0C) for 30 seconds. An older term popular in north America and Canada where cold starting is critical. Reserve capacity (RC): This is sometimes listed as well as or instead of CCA. ≈ means approximately equal to. So for a battery listed as having 330 CCA. Danger! This battery produces enough current to kill a human. Do not touch both terminal at the same time. Do not allow a metal or conductive object to touch both terminals at the same time. If the battery came with a plastic cap to cover one of the terminals, use this cap when the battery is not is use for safety purposes. This design of battery is very old ( from 1913) almost 100 years old as I write this. Prior to car batteries being used in cars the driver was required to actually hand crank the car to make it start. You many have seen this in very old films. The battery is made from pure lead plates suspended in (30% by volume) sulfuric acid mixed with distilled water. Tap water river water or boiled water cannot be used. if the wrong type of water is used or hard water salts (calcium) enter the battery it will cease to charge or hold charge. the outer case is acid resistant plastic. This battery or one very similar will be in almost every car on the road, so know about how it work would be good an in the future there will be less cars and a lot of these batteries, at least for a while. 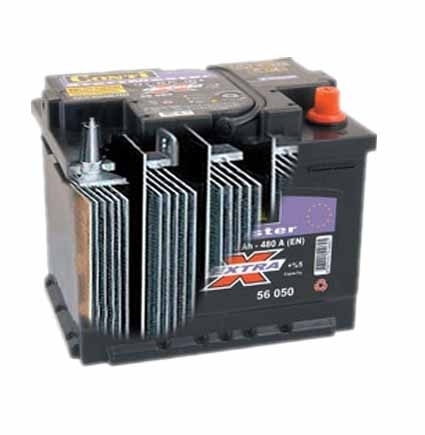 There are many option for charging a car battery, an AC charger, a solar panel with or without charge controller, or the most obvious, a car alternator that is turning, rectified and charging (may or may not be part of a working car). Having more than 40 Amp hours of capacity means in most cases they don’t need a charge controller for charging from 12 Volt solar PV. If you are able to measure the actual voltage of the battery you should be advised that 12 volts is a misnomer. The battery is fully charged at 13.8 volts when the battery is at 12 volts its actually getting quite flat. Most 12 Volt inverters will shut down if running from 11 volts. 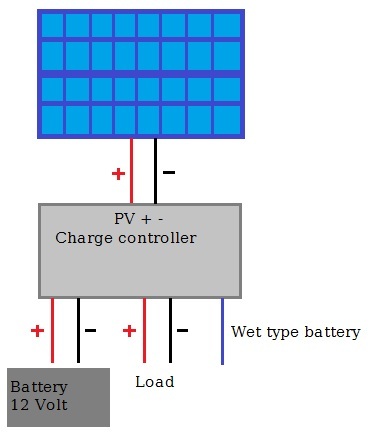 If using Solar PV it is actually possible to charge the battery to a float voltage of 14.4 volts but this voltage is not able to be stored long term, its effectively floating on top of the 13.8 volts and drains away quite quickly under load. The small screw top lids on the battery (there will normally be 6, 2 for every volt a battery produces) are for releasing pressure that might occur as the battery charges and for adding distilled water if the acid dries out too much. This pressure is caused by the release of Hydrogen gas (H2) and is explosive. So while a battery is charging you should treat it as explosive. Never use a cigarette lighter to look in side a battery. If you leave the lids on a battery as it charges it may swell dangerously and even fracture the casing, destroying the battery and spilling toxic and acid contents everywhere. The production of hydrogen gas is usually a sign or result of overcharging, charging too fast or calcium/scale buildup on the plates. It is possible to recondition a battery from calcium build up which requires the use of washing soda and fresh or cleaned sulfuric acid. 1) Discharge the battery. Take the pressure release lids off and empty the fluids from the battery, attempt to estimate the volume of fluids removed. Make note of this volume. 2) Make a solution of washing soda (NaHCO3) in distilled water and pour this into the battery. 3) Wait at least 48 hours. The battery will make a fizzing or bubbling noise, this is normal and safe, the gas released will be CO2. 4) Empty out he battery again and rinse out with distilled water. 5) Make a up a 30% volume sulfuric acid (H2SO4) solution with distilled water and fill up battery. 6) With lids off, attempt to charge the battery. Posted in 12Volt, Battery, Electrical, Energy.